USPS Cubic Pricing provides high volume shipping customers discounted rates for small, heavy packages. Priority Mail packages weighing less than 20 pounds and measuring no more than 0.5 cubic feet in volume are eligible for Cubic Pricing as long as you meet the minimum package requirements. For these packages, customers will pay shipping costs for the actual size of the package and the shipping distance instead of its weight. Compared to other shipping carriers such as FedEx and UPS that only offer pricing based on weight and distance, USPS Cubic Pricing is a great alternative to help lower shipping costs. In order to qualify for Cubic Pricing, customers must ship over 50,000 packages a year. How does Cubic Pricing work? 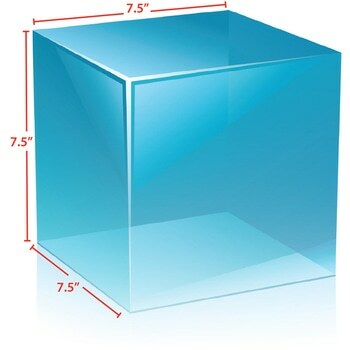 As an example, an 8" length x 6" height x 8" width (Tier 3) package weighing 8 pounds and being shipped to Zone 6 would cost $20.79 using Priority Mail Commercial Base rates. The same package would cost only $8.39 with USPS Cubic Pricing. That is a 59% savings! FOR PACKAGES WEIGHING LESS THAN 20LBS. As an example, an 8″ length x 6″ height x 8″ width (Tier 3) package weighing 8 pounds and being shipped to Zone 6 would cost $21.82 using Priority Mail Commercial Base rates. The same package would cost only $10.18 with USPS Cubic Pricing. That is a 51% savings! To start using cubic pricing with your Stamps.com account, contact our Shipping Solutions team. Experienced with implementing customized, high-volume pricing agreements with the USPS, our Shipping Solutions Specialists will ensure your eligibility and assist you with completing your pricing agreement. Once approved by the USPS, Stamps.com will automatically integrate cubic pricing into your software free of charge, ensuring you receive the correct rates and eliminating the need for any manual price entry.